Digital technologies continue to disrupt and re-write the rules of doing business. Digital transformation is taking place at lightning change in almost all industries and has become a fundamental condition for the future survival of businesses. At the heart of this movement are the increasingly connected and empowered customers who have taken the personalization of products and services and the very definition of brands to the next level. Building the right digital strategy with the right ingredients is key to reap the benefits of the digital revolution. The ability to drive and manage the change across the organization coupled with strong leadership capabilities is also indispensable. 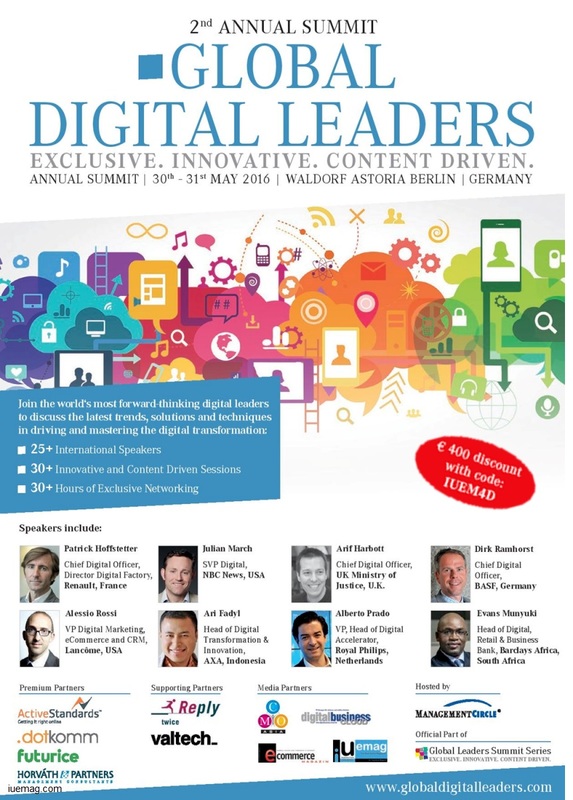 The Global Digital Leaders 2016 is the unparalleled opportunity to discuss current challenges and explore trends shaping tomorrow’s business in the fast-paced digital landscape. Connect with innovative minds from around the world and learn from their successes and failures to enhance your digital strategy. The interactive, fresh and content driven format is specifically designed for digital leaders, visionaries and decision makers from across all industries. Discover how the world's top Digital executives are keeping their corporations ahead of the curve, while immersing yourself in Germany's most innovative and progressive city. Meet and hear from top Digital leaders from Orange, UK Ministry of Justice, Hubert Burda Media, The Walt Disney Co., ProSiebenSat.1, Expedia, and many more. Learn how to align Digital Transformation, Change Management and improve on Digital Leadership. Discuss the Mobile Strategy and how to Transform Customer Experience and achieve Competitive Advantage. Take part in our renowned Think Tank Academy, engage vibrant panel discussions and participate in our well-balanced networking sessions. Any facts, figures or references stated here are made by the author & don't reflect the endorsement of iU at all times unless otherwise drafted by official staff at iU. This article was first published here on 29th January 2016.